In the tradition of Rizzoli’s Historic Houses of the Hudson Valley and The Houses of McKim, Mead & White, Great Houses of New England features a stunning array of newly photographed houses that range over four centuries and are distinctive examples of the architecture of the region—from the mid-seventeenth-century New England Colonial Judge Corwin House (Witches House) in Salem, MA., and the eighteenth-century Jeremiah Lee Mansion in Marblehead, MA., to the late-nineteenth-century McKim, Mead & White Shingle-Style Isaac Bell House in Newport, R.I. With lavish photography of sumptuously appointed interiors including many rarely seen rooms, wonderfully detailed house exteriors and gardens, and authoritative text by architectural historian Roderic H. Blackburn, Great Houses of New England comprehensively considers the magnificent building styles of the region—including Early New England Colonial, Georgian, Federal, Greek Revival, Gothic Revival, Italianate, Shingle Style, Colonial Revival, and Tudor. 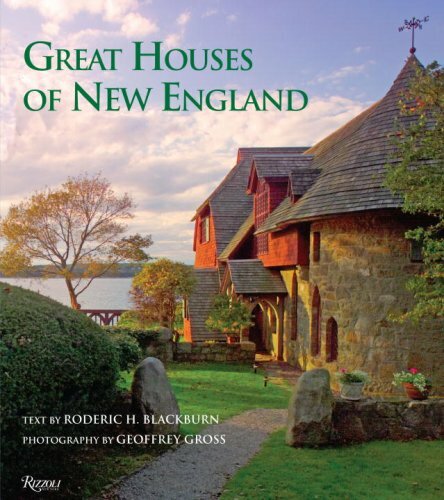 Great Houses of New England is a landmark work of enduring interest to homeowners, architects, architecture historians, and all those who love fine architecture and interiors. Geoffrey Gross is a widely published photographer whose work has appeared in Art & Antiques, The New York Times Magazine, Better Homes and Gardens, Interior Design, Popular Mechanics, and elsewhere. He is the photographer of Rizzoli’s Stone Houses of Bucks County and Dutch Colonial Homes in America. Roderic H. Blackburn is an ethnologist and architectural historian who has held positions as Director of Research at Historic Cherry Hill, Assistant Director of the Albany Institute of History and Art, and Senior Research Fellow at the New York State Museum. He is the author of Dutch Colonial Homes in America.